Today I put on a tea party for a friend and myself. We ate lots of goodies and drank lots of tea. Hope I can get to sleep tonight. This was one of my gifts from her. 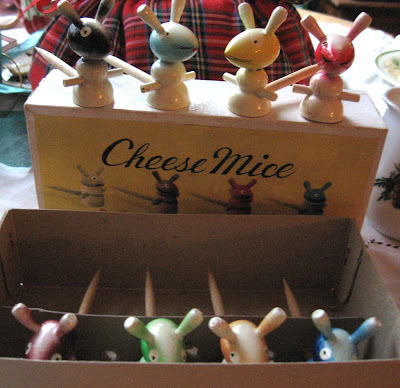 Vintage Cheese Mice! As it says on the box, great for serving hor'dourves, especially cheese! They look as though they have never been used. They were made in Japan. I love them! holy crap those are cute!